Win A Free adepoy Full Face Snorkel Mask | FreebieOrBust Freebies! We have the most outstanding sweepstakes deals on offer online! We have the best deals on the internet, with a wide range of popular products – but you’ll never win if you don’t sign up! 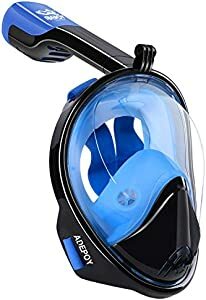 adepoy Full Face Snorkel Mask, Snorkeling Mask for Adults and Kids with Detachable Camera Mount, 180 Degree Large View Dry Top Set Anti-Fog Anti-Leak Blue-Black S/M. Your chances of winning are 1:2000. Total number of prizes: 1. Sweepstakes hosted by Amazon and adepoy snorkel mask. What are you waiting for? Seize the day and register right now for the chance to win on our next sweepstakes deal! Do you want to see more fantastic giveaways? Bookmark our site for easy access to the world’s premier sweepstakes platform.